This is a super quick recipe for a party or nibbles. Very, very tasty too! 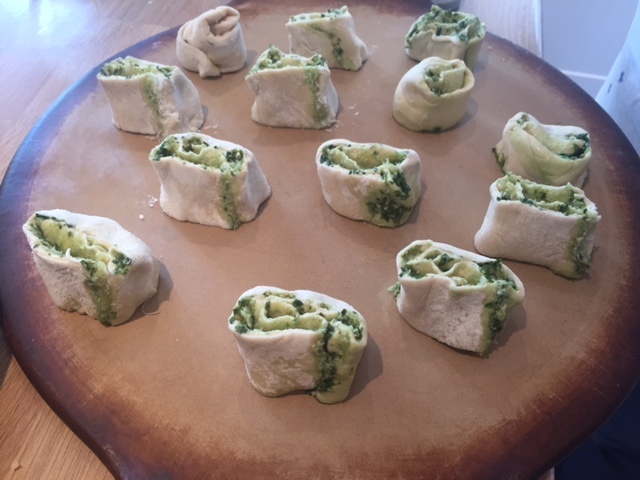 Pesto Pinwheels ready for eating! YUM!! Lightly brush Medium Bar Pan with sunflower oil; set aside. Place pizza base mix in Classic Batter Bowl. Measure warm water in Mini Measure-All® Cup; add enough water to pizza base mix, mixing to form a soft dough. Knead dough on lightly floured surface 5 minutes or until smooth. Roll out dough on a lightly floured surface using outer tube of Mini Measure-All® Cup to form 30 x 17 cm rectangle. Leave to rise 15 minutes. Meanwhile, finely grate cheese into clean batter bowl using Microplane® Adjustable Fine Grater. Press garlic using Garlic Press into batter bowl and mix gently into cheese using Small Mix ‘N Scraper®. Roll basil leaves up together and cut into fine strips using Colour Coated Santoku Knife on Bar Board. 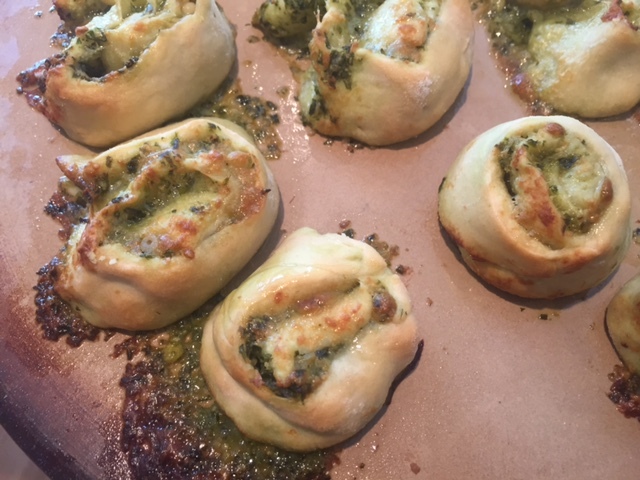 Spread pesto evenly over bread dough using back of Small Mix ‘N Scraper®. Sprinkle basil leaves and cheese mixture evenly over pesto. Starting from a long side, carefully roll up dough rectangle to form a tight roll. Cut roll in half widthways. Cut each dough half widthways into 10 even sized slices using Santoku Knife on Bar Board. Transfer pinwheels onto Medium Bar Pan, spacing apart evenly and neaten into rounds if necessary. Bake 15 – 17 minutes or until pale golden brown. Transfer pinwheels to a serving plate. Serve warm. Cook’s Tip: Substitute the red pesto with green pesto, if desired. These appetisers are best served warm and eaten on the day made. © 2015 The Pampered Chef used under license. 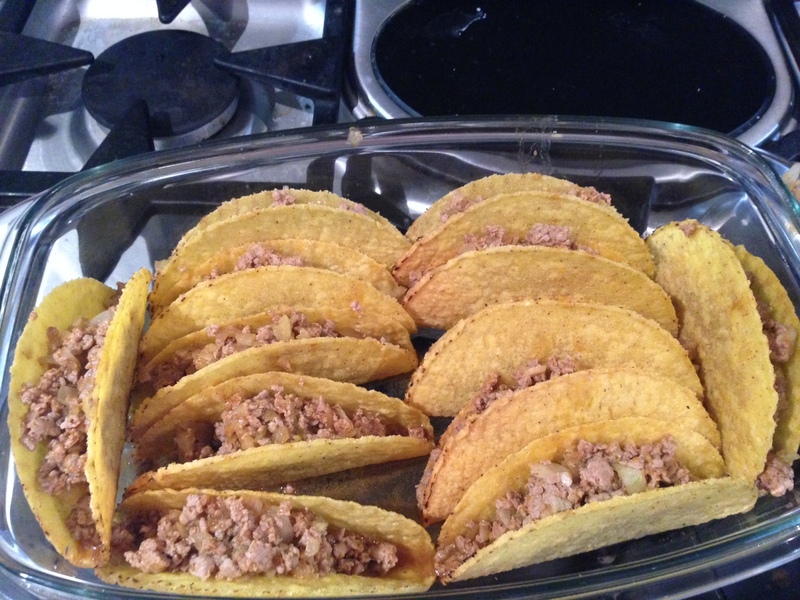 The finished Tacos – Yum! These are from the brand new Pampered Chef Season’s best recipe collection. They really are easy to make and they were gobbled up by the whole family (including my spice averse son!). My only error (I make the mistakes so you don’t have to!) was to not let the mince cook until nearly dry. 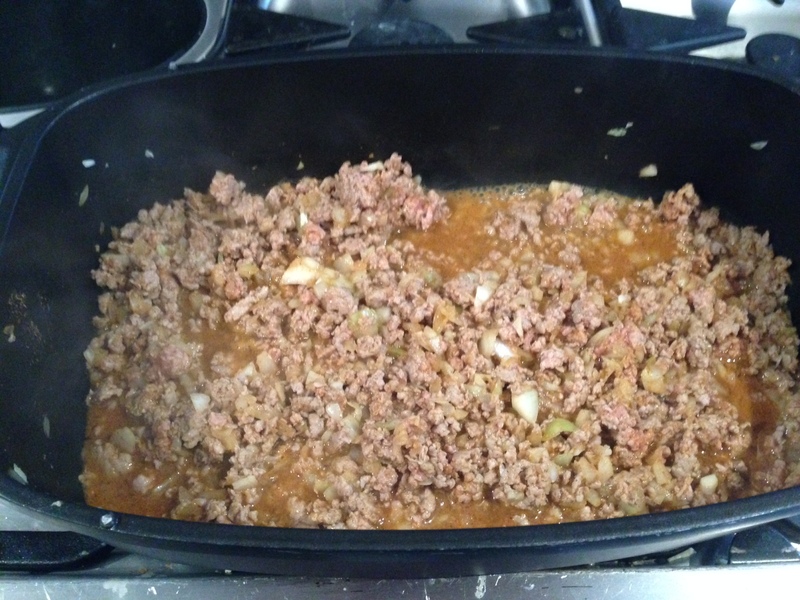 My mince still had some juice left (see the picture below) which I then proceeded to spoon into the tacos. This made some of them go soggy on the bottom (and who needs a soggy bottom really?!) and the taco didn’t stay in tact which made for slightly tricky eating… we managed though!!! Preheat oven to temperature directed on taco shell packet. 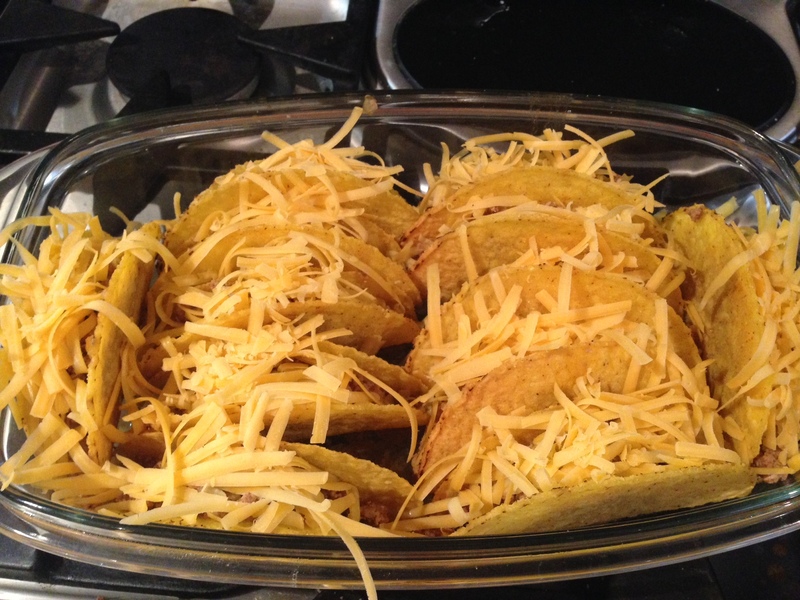 Separate taco shells and arrange, open-end down, overlapping slightly in lid of Covered Roaster; set aside. Grate cheese usingMicroplane® Adjustable Coarse Grater; set aside. Finely chop onion with Food Chopper on Cutting Board. Add oil to metal pan of Covered Roaster; heat over medium heat 1 – 2 minutes or until hot. Add turkey; cook 4 – 6 minutes or until no longer pink, breaking into small pieces using Mix ‘N Chop. 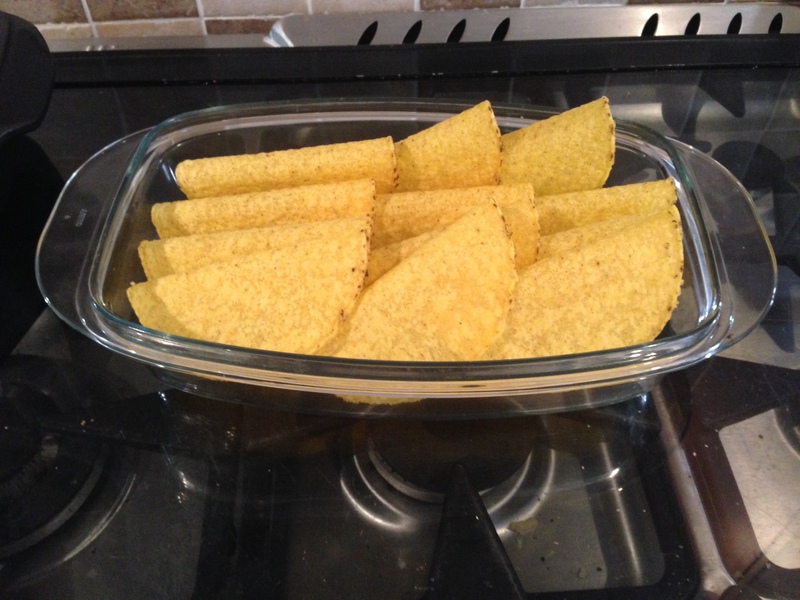 Meanwhile, bake taco shells in preheated oven as directed on packet. Add onion, taco seasoning mix and water to turkey; cook 2 minutes or until simmering, stirring occasionally using Bamboo Spatula. Remove tacos from oven. Set oven to 200°C/fan oven 180°C/Gas 4. 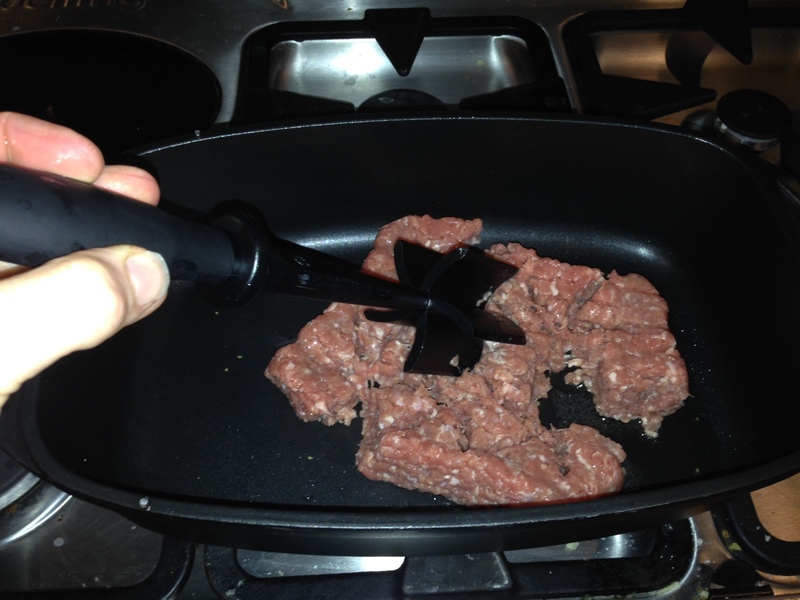 Fill each taco shell using Mini Mix ‘N Scraper®, dividing evenly. 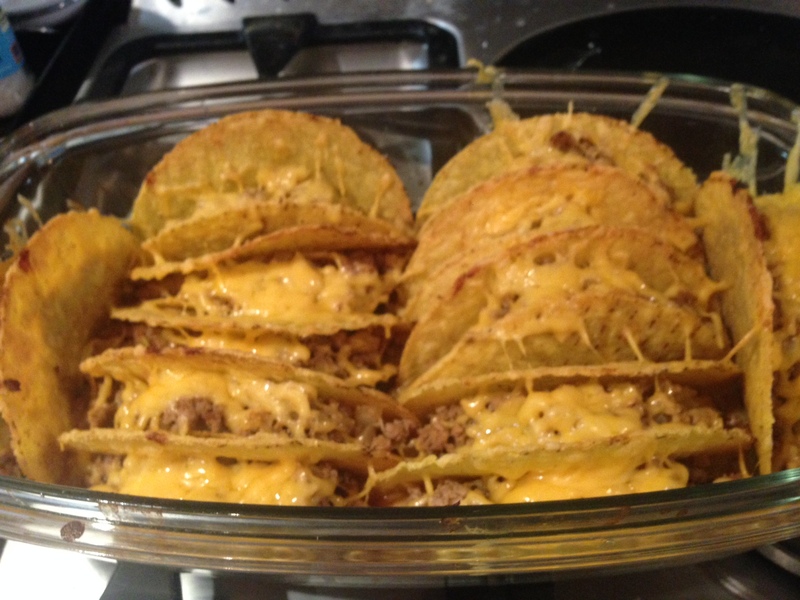 Top each taco shell with grated cheese; place tacos in lid and return to oven. Bake 4 – 5 minutes or until filling is hot and cheese just begins to melt. Remove lid from oven. Serve tacos immediately accompanied by toppings in Bamboo Small Snack Bowls, if desired. Cook’s Tip: This recipe serves 4 – 6 as a main course with a green salad, or serves 12 as part of Mexican party buffet. Guacamole can be substituted for the soured cream topping and tomato salsa for chopped tomatoes, if desired. For a variation, add 1 can (400 g) red kidney beans in water, rinsed and drained, together with the onion in step 4.